One of the questions I became interested in during my MSc research on ankylosaur tail club biomechanics was how the tail club evolved in the first place. Most ankylosaurs with tail clubs are known from a relatively narrow slice of time right at the end of the Cretaceous, but when and where did the tail club first evolve? Did the stiffening of the tail occur before the enlargement of the tail osteoderms, or vice versa? Or did both changes happen at about the same time? This was a fun question to address during my PhD research, once I had a fairly well resolved phylogeny of ankylosaurids, and once I had looked at tons of ankylosaurid fossils. So, how did the ankylosaur get its tail club? Well, based on what we see in the fossil record, it looks like the changes to the vertebrae predate the changes to the osteoderms – in other words, the handle comes first and the knob comes later. There is at least one ankylosaur out there that seems to have a tail club handle but not a knob: Gobisaurus! Hello Gobisaurus! Many many thanks to my friend and colleague Sydney Mohr for preparing this awesome illustration of Gobisaurus for me. Gobisaurus, a shamosaurine ankylosaurid, has a really nice complete tail club handle that is indistinguishable from other ankylosaurid tail club handles, but does not have a knob. And it’s not just because the knob is broken off – it seems as though the last vertebrae in the tail are preserved, because they look very similar to the terminal vertebrae in a CT scan of a tail club from the University of Alberta collections. It’s likely that Gobisaurus had osteoderms along the sides of the tail like we see in most other ankylosaurs, but it doesn’t appear that there were osteoderms tightly enveloping the tip of the tail. An even earlier ankylosaur seems to show some changes towards acquiring a tail club handle, as well. Liaoningosaurus, a basal ankylosaurid known only from a very small juvenile, has distal caudal vertebrae where the prezyapophyses extend about 50% the length of the adjacent vertebra. This is what we see in ankylosaurid tail clubs, but not in more basal taxa like Mymoorapelta where the prezygapophyses are much shorter. Liaoningosaurus is missing the tip of the tail and also lacks osteoderms on most of its body because it’s a juvenile, so it’s harder to say whether or not it had a tail club knob based just on the fossil alone. I also did a cool and relatively simple thing with my phylogenetic tree to see if I could better understand the likelihood that some ankylosaurs without preserved tail material had a tail club handle or full tail club with a knob. 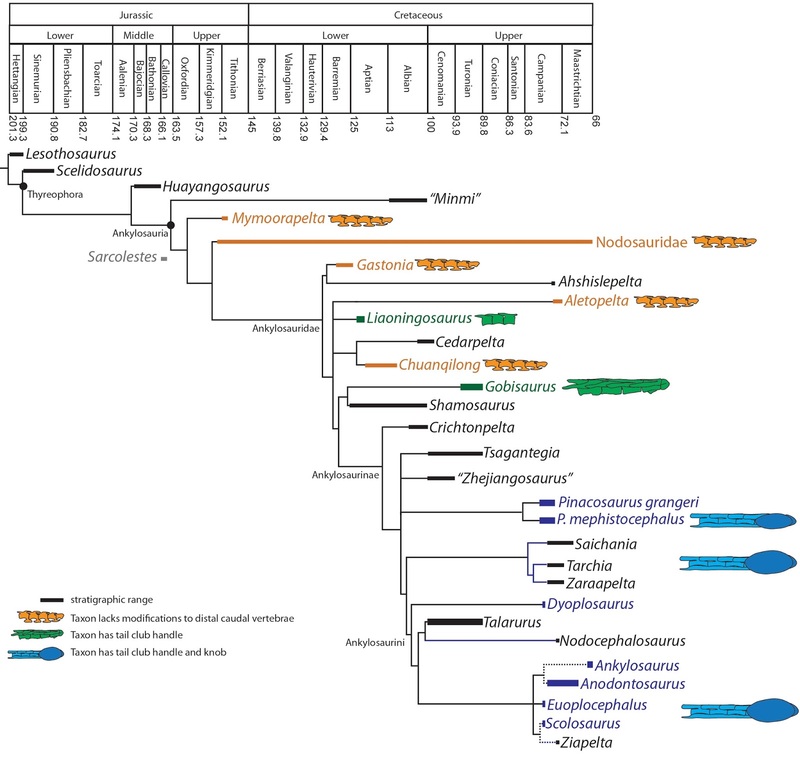 Unsurprisingly, all shamosaurine and ankylosaurine ankylosaurids probably had a tail club handle. Liaoningosaurus is part of a basal polytomy of ankylosaurids, and it was a bit more equivocal whether or not any of these taxa was likely to have a tail club handle or not, partly because another basal ankylosaurid in this region of the tree, Chuanqilong, does not have modified distal caudal vertebrae. All ankylosaurine ankylosaurids more derived than Pinacosaurus (so including things like Tsagantegia, Saichania, Euoplocephalus, etc.) almost certainly had a tail club knob, and shamosaurine ankylosaurids probably did not. Crichtonpelta, the most basal ankylosaurine, may or may not have had a tail club – we’ll need more data to know for sure. There is amounted skeleton of Crichtonpelta at the Sihetun visitor center in Liaoning, and it is shown with a tail club, but it isn’t clear whether or not this is sculpted or original material belonging to this specimen, and a full description of this material is necessary. Gobisaurus and Liaoningosaurus both lived much earlier than the more familiar tail-clubbed ankylosaurs: Gobisaurus is no younger than 92 million years old, and Liaoningosaurus is about 122 million years old. 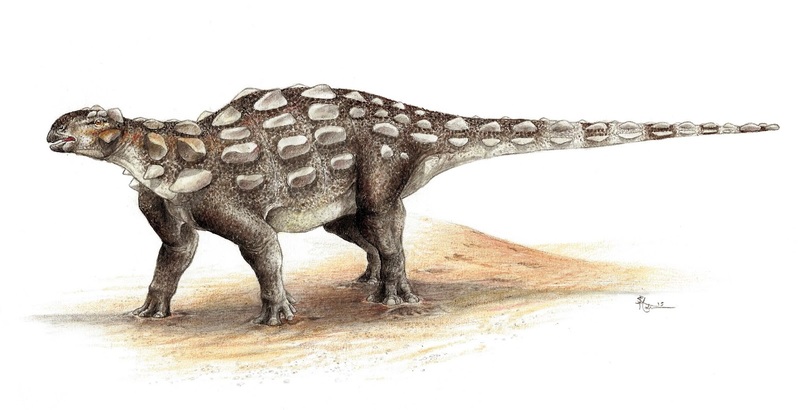 The earliest ankylosaurid with a tail club in the fossil record is Pinacosaurus(from the Campanian), although there is a caveat to this: Talarurus, which is a bit older than Pinacosaurus, should have a full tail club based on its position in the phylogenetic tree, and while a tail club handle is known for this taxon, we haven’t found a tail club knob for Talarurus. Talarurus is in kind of a weird spot phylogenetically, since it’s from Mongolia but comes out as closely related to North American ankylosaurines, so I think it’s worth keeping an eye on this taxon in the future – perhaps Talarurus is another taxon with only a handle and not a knob, which would fit a bit better with its chronologic position if not its phylogenetic position. Regardless, the changes to the vertebrae of ankylosaurs, starting with Liaoningosaurus at least 122 million years ago and continuing on towards Gobisaurus about 92 million years ago, seem to have occurred long before ankylosaurs evolved a huge osteodermal knob at the end of the tail. Was a stiff tail as good a weapon as a full tail club with a knob? What drove the evolution of the knob so long after the evolution of a stiff handle? And why did ankylosaurs even evolve a tail club at all? Now that I’ve had fun investigating how ankylosaurs might have used their tails, and how the tail club evolved, the next question feels like it should be ‘why’….so stay tuned for more tail club fun over the next year or so as I make an attempt at that question! Read it for yourself! Arbour VM, Currie PJ. In press. 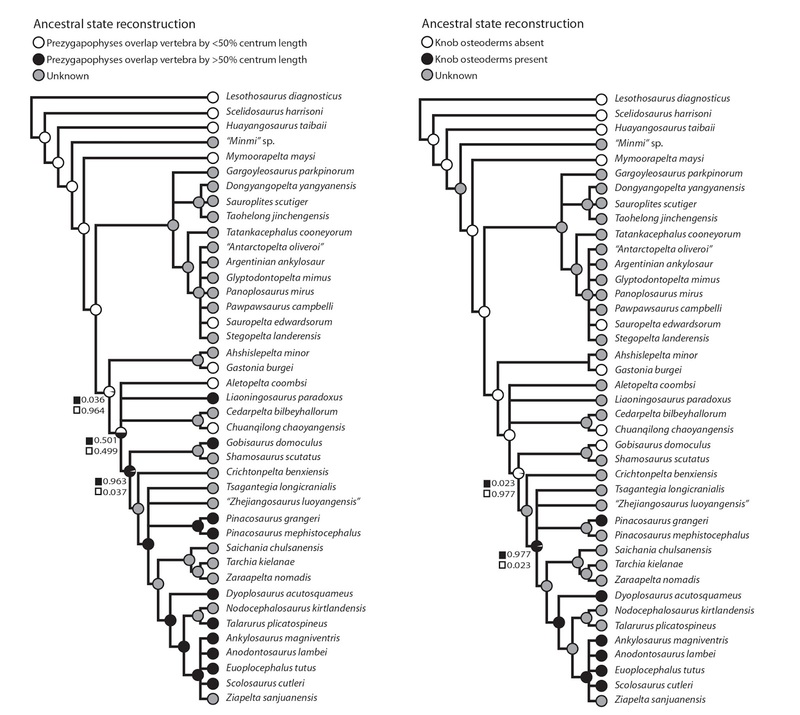 Ankylosaurid dinosaur tail clubs evolved through stepwise acquisition of key features. Journal of Anatomy. Pinacosaurus is the earliest ankylosaurid known to have had a caudal bludgeon? I dunno–the more recent dates for what I presume to be Alaagteegian beds are younger than 75 Ma, whereas Euoplocephalus was about that age. Lol, no way a stiff tail was as good a weapon as one with a knob. I suspect part of the reason for the evolution, first of stiff distal caudals and then a club, was the need to avoid being disarmed in combat. If the ankylosaur (or any thereophoran) could initially keep a theropod at bay with its swinging tail, the attacker might try to overcome it by wrecking its defense. An infected thagomizer, broken spikes, and chewed nodosaur caudals are known, besides possible bite marks in knobs. A stiff distal tail was harder to chew off than a flexible one, and a knob harder still. Tyrannosaur evolution, by Campano-Maastrichtian time, may have made the need for resistance especially acute given the enhanced penetrating ability of tyrant jaws (whereas earlier theropods had slashing jaws). I recall that a stiff tail with interlocking vertebrae could absorb and transmit impact force better than a flexible one, so there's that. And then perhaps the tail club evolved to protect the tail's tip, since the force being greatest at a pendulum's distal end could backfire and the animal would also injure itself. Although if it were pitted against the fleshy legs of a tyrannosaur or other predator, I imagine the problem wouldn't be as severe. Up against armor, however, and the tail would need protection to keep from self-injury, hence the tail club. I guess this goes back to what you've suggested before about ankylosaur tails possibly being used primarily for intraspecific combat over predator defense, I believe you mentioned. Thoughts? Thanks! For the science behind the phylogenetic trees, I use Mesquite to assemble my character matrix and TNT to analyze the data (both are free to download). I then take the results files and make nicer looking diagrams in Adobe Illustrator (sadly, not a free download by a long shot). I think there's a good chance that ankylosaur tail clubs were being used for intraspecific fighting, for sure! Some research along those lines is currently on my to-do list! In one of his papers, Coombs concluded clubs probably weren't used for intraspecific fighting. Carpenter suggested head to head shoving like in tortoises. It may say something that clubs appeared in the Campano-Maastrichtian period, coinciding with predators potentially most dangerous to ankylosaurs, whereas intraspecific fighting had presumably occurred long before that. Also, if the club were essential to protect the tail tip from injury while striking the armor of another ankylosaur, why did it take so long to evolve? As we now know, armor long predated clubs. Hmm, starman has some good points. This might contradict what I said before, but maybe ankylosaur tails first started off as anti-predator weapons while they competed with each other head-to-head. Then it wasn't until later that some species incorporated their tails into their intraspecific competitions in addition to the primary method of head-to-head shoving. Then perhaps from there, ankylosaurs gradually used their tails against each others' armored hides more frequently, and that was when tail club evolution set into play. Coincidentally, that evolution also made them even more powerful weapons than they already were, and effective predator defense further fueled the evolution of large and sophisticated tail clubs. Or at least that's my thought. Starman, if I may be so bold to say that I would think that predators would try to get around and avoid such a dangerous weapon and target a more vulnerable region rather than take it on directly and risk greater injury. I do find your idea very interesting, though. In any case, you've definitely got me interested in those papers you mentioned earlier. Can you tell me where I can find them? I'd like to add something. There's little doubt the terminal caudal weaponry of stegosaurs–the thagomizer–was an antipredaor weapon. At least one study identified a stegosaur spike as the cause of injury to an Allosaurus proximal caudal; another attributed the pubic injury of another to this weapon. If stegosaurs needed caudal weapons to repel Allosaurus, wouldn't ankylosaurs have needed something to deal with even deadlier enemies—Daspletosaurus, Tarbosaurus, Tyrannosaurus? IMO it's no accident that clubs appeared and/or became large among ankylosaur contemporaries of such taxa. Why, this is simply a distraction from the real reason for the tail-stiffening – clearly, this is the equivalent of the rigid tails sported by dromeosaurs. Obviously, as the ankylosaurs were dashing and leaping about, having a stiffened tail was very helpful in keeping them on the track, what with high-speed cornering and all. I visualize a pack of ankylosaurs competing for mates as a sort of Mesozoic NASCAR form of a lek. Come to think of it, that would also explain the evolution of the tail club! I think the tail isn't quite long or heavy enough compared to the rest of it's massive bulk for that function, especially in early ankylosaurs without tail clubs. In dromaeosaurs, the tail takes up a greater deal of it's length and its total mass, hence its greater suitability to counterbalance the predator during tight turns. And the S-shape and high-held position of the tail makes it all the more efficient, as opposed to the lower, ground-hugging position of ankylosaur tails. Plus there's the feathers on its arms and tail tip to aid in stability during sharp turns. Maybe in ankylosaurs with heavy tail clubs, this might be possible to a lesser degree, swinging it in the opposite direction it wants to turn such as seen in cats, but I doubt it'd be the primary function or as effective as in cats and dromaeosaurs. The stiffened tails would work better in deterring predators from attacking it. With high-speed cornering, I'd think its quadrupedal gait already gives it a good deal of support and stability for such turns. I know cats are also quadrupeds and utilize the tail counterbalance, but they also have a narrower, more flexible speed-built gait that would better benefit from a tail counterbalance as opposed to the wider, more defensive and ground-hugging gait in ankylosaurs (not to say they aren't by any means slow, just more built for defense than speed). I do find your race-car idea pretty interesting, though. I can imagine this as a possibility, especially if coupled with tail swinging in attempt to wear each other down, given that their tails would have strong muscle attachments to the hind legs.